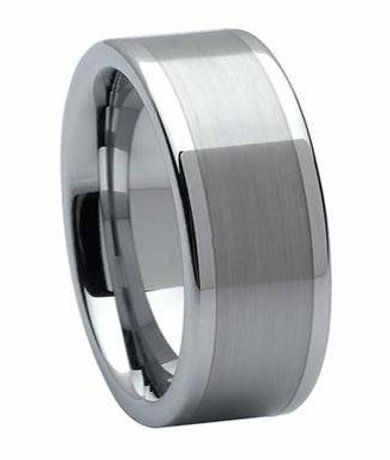 Stylish and virtually indestructible, this tungsten carbide ring is one of our most popular men's tungsten wedding bands. 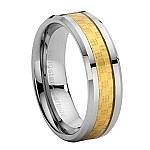 Tungsten is a very heavy and durable metal and is a great choice for men who work with their hands. 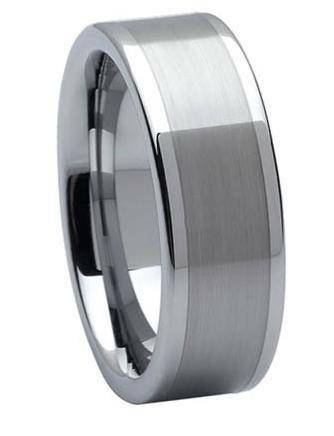 The face of this 8 mm ring is brushed and the outer edges are polished to a brilliant shine. A Comfort-fit band means the inside edges are rounded for a smooth and comfortable fit. Comfort-fit rings should be ordered 1/2 size smaller! We just received the ring in the mail today. Shipping was fast and ordering was simple. Perfect fit and style ring. A gift from my wife to replace my old wedding ring, was everything I wanted in a ring. Sleek, bold, and sparkling...Has great stature, yet basic which is what I like. The width alone is perfect for my long hands. First time wearing a comfort-fit ring and will never go back. Perfect! I bought this ring because my husband needed a tighter ring for winter. Since it's so cold here in SD. The ring is perfect size! Shipping only took 3 days for me. He likes this ring better and I spent so much more on his other ring. So happy I found this site!!! I'll be ordering again! Was very surprised when my fiancé chose this ring and figured he'd go white gold or platinum. The ordering and shipping was simple and quick! Got the ring and it is solid, smooth, and seems really good quality. Looks exactly like the picture. My fiancé loves it, I love it! Really good ring! This will go in a jewelry for way more money! Can't beat the price!